I've sampled many of the food trucks that offer Mediterranean style dishes, and I can say without a doubt this is simply the best one. The falafel is fresh and delicious, and the hummus is amazing. You also get a Israeli salad and a tabouli salad, both of which are great; a full pita, toasted with olive oil and seasoning; and a side of tahini. It is a LOT of food. Typically I get this for lunch and then have a small salad for dinner, as it is very filling. I can't speak as to the fries, but I am planning on trying them at some point. I've heard great things about them! I get excited knowing it's Tuesday, DCBallers day! I don't usually walk several blocks in hot/humid DC summers...except for this! Falafels are NOT/NOT created equal. 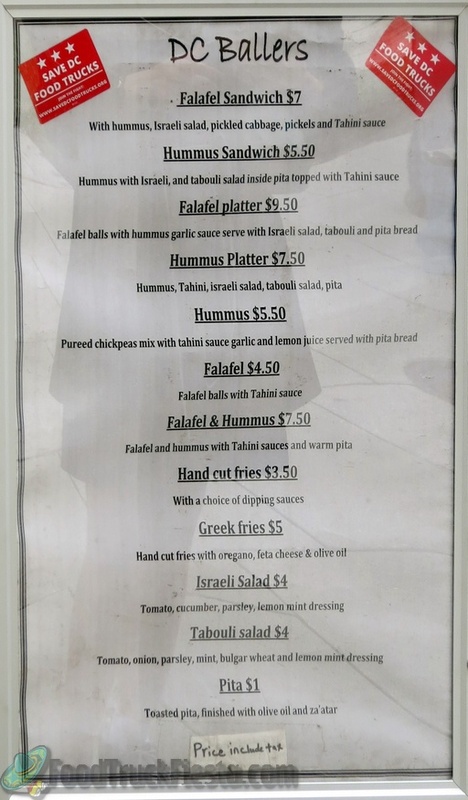 I "strayed" and tried another falafel food truck one day, never again! The food is great and the customer service is ALWAYS excellent. This is probably the best food truck i've been to. I'm relatively picky with my food but honestly, i have nothing bad to say about this truck. The Falafel Sandwich is literally packed with amazing falafel and condiments that blend very well together. And their fries are probably the best fries I have ever had. Crispy, flavoful and you have to try it with the chipotle mayo dipping sauce. The food tasted great until I discovered a hair in my food that was NOT my hair. Lost my appetite and my money. Please wear hair nets! First time trying this truck and I will surely go back. The falafel sandwich was huge, packed and delicious. I wasn't too fond of the pickles so next time I will ask them to leave it out. Otherwise, I really liked the sandwich. However the star of this meal was the bag of fries. These are some of the best fries I have had in years. Crispy, but not oily, freshly done, and with some kind of unusual seasoning on it that complements the fries perfectly. They give a huge bag - I shared with three other people in the office. I had the chipotle mayo sauce because they had no more garlic sauce - but really, these fries need no dipping sauce - they are yummy all on their own. I enjoyed this meal, especially the fries, and I will definitely go back to this truck. It was a lot of food and very fresh. The customer service was excellent. What an incredible, authentic falafel experience. I was referred by a friend, and he is a better friend now! Love the pickles on the sandwich - just the right tang! I ordered hummus, falafel, and fries (no pita, gluten allergy)--the truck owners accomodated by saving me a dollar for not wanting the pita. Hummus was good, nice texture and not soupy, but I felt they put a little too much extra tahini on top. Falafal--yes, they look green on the inside, but they taste really good. For such small balls they pack a punch! Fries--to die for. crispy on the outside, creamy on the inside, with salt and other seasonings (sumac? ), just the right amount of grease coating your fingers to know it wasn't a frozen product. And they gave me such a huge bag I had fries for lunch, dinner, and breakfast! Worth the wait. Three stars is actually my average rating for the truck. I'd previously gotten fries from the truck and liked them enough to want to try the slightly more expensive Greek fries. Not sure what it was supposed to taste like, but it was not appetizing. Won't order those again. Not sure if I'll get anything else there. First time for this truck. The four falafel balls were crispy outside and moist inside, not overcooked like I've had most other places. Hummus was good (in my experience second only to Perfect Pita's hummus). The olive oil and seasoning on the pita was incredibly tasty; nice touch! -1 star because of price/portion. I just thought that for $7.50 the portion could have been larger, or better yet the price a bit lower for the portion. I'll definitely go back, though. 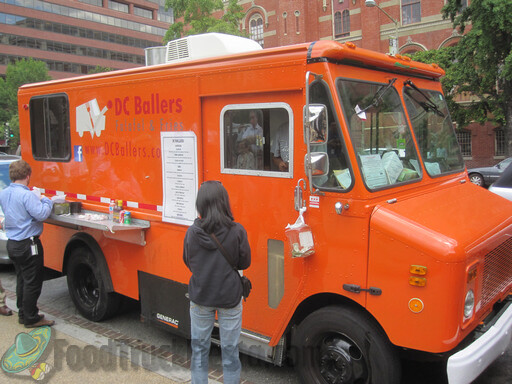 DC Ballers food truck serves falafel & fries with different dipping sauces – check out the menu below. They launched on April 18, 2012.